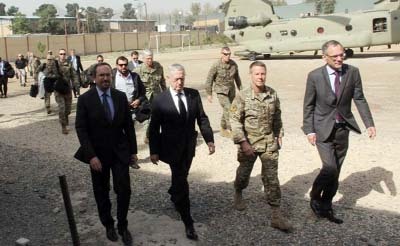 US Defense Secretary Jim Mattis has arrived in Afghanistan on an unannounced visit as Washington is pressing ahead with efforts to hold peace talks with the Taliban. US Defense Secretary Jim Mattis met Afghan President Ashraf Ghani during an unannounced visit to Kabul on Friday to discuss prospects for peace talks with the Taliban and the country's deteriorating security situation ahead of upcoming elections. Mattis was accompanied by Chairman of the Joint Chiefs of Staff Marine General Joseph Dunford, who earlier in the week had gone to Islamabad with Secretary of State Mike Pompeo on a mission to reset testy relations with Pakistan's new government. The United States is a year into its latest attempt to step up pressure on the Taliban by increasing air strikes and sending thousands more troops to train and advise the Afghan National Defense and Security Forces (ANDSF). Meeting Ghani in his presidential palace, the U.S. officials discussed progress to end the 17-year-old war, which has become America's longest conflict. "They discussed peace process, positive impact of the South Asia strategy, reforms in ANDSF, upcoming parliamentary and presidential elections, counter-terrorism and dialogue with Pakistan," Ghani's official spokesman said in a tweet after the meeting. During recent weeks, the Taliban killed hundreds of soldiers and police and briefly seized the strategic city of Ghazni in a high profile assault. Speaking with reporters prior to his arrival in Kabul, Mattis said he was hopeful about peace talks with the Taliban, despite the questions over Washington's strategy in Afghanistan. Over the summer, a top U.S. State Department official met Taliban officials in Qatar to try to lay the groundwork for broader peace talks. The U.S. government has pointed towards the Taliban accepting a temporary truce in June, as a sign of why the talks should be viewed with hope. "The most important work that has to be done is beginning the political process and reconciliation," Dunford told reporters traveling with him.